Ohio has chosen to use the federal exchange for health insurance rather than implementing a state-based exchange. The federal exchange is located online at Healthcare.gov. There are four methods an individual can use to apply for health care insurance: mail, toll-free phone, online at Healthcare.gov, and in person through certified navigators. The toll-free phone number patrons can call for assistance is 1-800-318-2596 (TTY: 1-855-889-4325). Assistance is available in multiple languages. If you are seeking health coverage through the Health Insurance Marketplace, open season for 2015 will likely begin on November 15, 2014.You can enroll in Medicaid or the Children’s Health Insurance Program (CHIP) at any time. There is no limited enrollment period for these programs. There are many more books in the catalog. Click on the catalog tab on the main page and type in the subject. I am going through library records from the 1930’s-1960’s. It is interesting to see what was going on at the library back then. Many of the board reports were written on tablet paper or sometimes scraps of paper. There is a folder that contains information for an award the library won. There is also a very large folder with State Library correspondence. This letter came from that folder. It is addressed to the head librarian at that time, Vilma Pikkoja. The library services project supervisor at the State Library is telling Vilma that she will not be able to attend a workshop because it for general staff and not administration. Look at the unique way she tells her. These records and reports are available for viewing in the local history and genealogy room at the Central Library. Appearance of external links does not constitute official endorsement on behalf of HCDPL nor do they represent our views. HCDPL has sole authority to remove posts that are deemed inappropriate. This is a view of our library in the current building. The picture below is the golf course across the street. We actually do have patrons and visitors. The parking lot is empty, because I took these pictures on a Saturday after the library closed. We have a beautiful library in a beautiful setting, but it wasn’t always that way. The library actually opened December 7, 1928 in the basement of the county court house, but I’ve gotten ahead of myself. Discussion about the library began in 1905 when a group of concerned citizens wanted to use Carnegie money to build a new library. When someone in the group suggested that once they build the building they were responsible financially for the operations, the idea was abandoned. In 1916, the library was actually started in the basement of the courthouse with a part-time librarian, Miss Nellie Lohaas, but it was soon closed because of lack of funds. Eleven years later a local minister and extension agent worked together to once again create a county library. They formed a library committee and worked to open in 1928. Miss Beryl Cox was employed as the full-time librarian and began working with a Board of Trustees in 1935. The board was appointed by the MillersburgHardy Board of Education. Since it was now a School District Library, a librarian with a degree was needed. So poor Miss Cox was ousted after two years of service and in came Miss Helen Hastings from Kent, Ohio. I wonder what happened to Miss Cox; that might be another blog posting. Miss Hastings didn’t lose any time getting involved in the community. She created a Bible exhibit for Bible Sunday, became involved in other community events, and started summer reading programs and story hours. There was also a bookmobile of sorts; a private automobile was used to carry books from school to school. Circulation and library use increased greatly, which made it difficult to provide sufficient service to the area residents. Luckily, in 1956 money became available to purchase a Bookmobile, which was used to provide service to the county residents in 1958. The first bookmobile driver was Don Guthrie, and his wife was the clerk. Don is retired but still visits us at the library. The years 1958 and 1959 were expansion years for the library. Not only did the bookmobile extend library service, the library invested in the development of five branches. The branch in Killbuck was started first, with an emphasis on books for “tired eyes” — large print books. This was the focus of the local Lions Club and supported by the Head Librarian atMillersburg, Mrs. Vilma Pikkoja. Mrs. Herbert Allison was the branch staff member at Killbuck. TheHolmesville branch came next, with an emphasis on 4-H and youth materials. Mrs. Milton Koenig was their first staff member. Next, came the Nashville branch as the Rural Life Library branch. Mrs. Richard Galbraith was branch associate. Mrs. Ida Yoder lead the Berlin Branch, which was known as the Children’s Library. The Chestnut Ridge Branch, the Amish studies branch, opened in the old Amish school house in 1959. Mrs. Frank Kendle lead that branch. Mrs. Pikkoja was responsible for acquiring a building near the Courthouse in downtown Millersburg, which was bequeathed by Mrs. Daisy Patrick. The library remained there until 10 years ago when it moved to our current location on Glen Dr. Mrs. Patrick stated that the old building must return to the West Holmes School Board building if the library should leave. Adhering to her wishes, the West Holmes Board currently resides in that building. There have been many changes at the library since the first book was placed on the shelf in the basement of the courthouse, but the mission has remained the same–to provide quality materials and service to the residents of Holmes County. 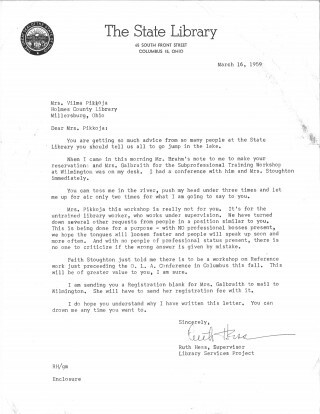 Information for this post has been taken from A Brief History of the Holmes County Public Library by Fred W. Almendinger.